A very simple workbench will serve your purpose for a long time. When you become a pretty good workman and feel the need of something better (for a first-class bench with the best attachments is really a great help toward doing good work), you will still find this first simple affair very useful in some part of your shop. 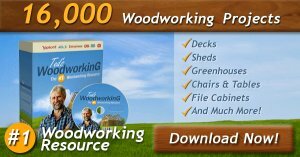 There is no need of a bench being made of stock of exactly the dimensions given, so if you have a pile of boards and joists to draw from without buying, you can, of course, substitute other-sized pieces, provided you use stock heavy enough to make a firm bench. Heavier legs and top (front board) would be better, and in fact there is little danger of making a bench too solid. If you can afford to buy one ready made, you cannot do better than to begin with such as are sold for sloyd or manual-training schools, but do not get a very small one unless you are only going to do very small work. Get one as large as you can afford. A second-hand bench can often be bought for a small sum, but be bare that it is firm and steady. The design is for a small bench, 5' 10" long, 2 wide, and 2' 6" high. A larger one can be made on the same principle. 1 board, 7/8" thick, planed, 12" wide, 12' long. 1 plank, 1 1/2 or 2" thick, planed, 5" or 6" wide, 2' 9* long. 1 strip, 1/2" to 7/8" thick, 3" or 4" wide, 15' long. Pine is good, and almost any cheap wood can be used. Hemlock is not very suitable, unless for the legs. Spruce is cheaper than pine or whitewood, and can be used for economy, but is prone to warp and twist and should be thoroughly nailed. First make the legs and fasten them together. 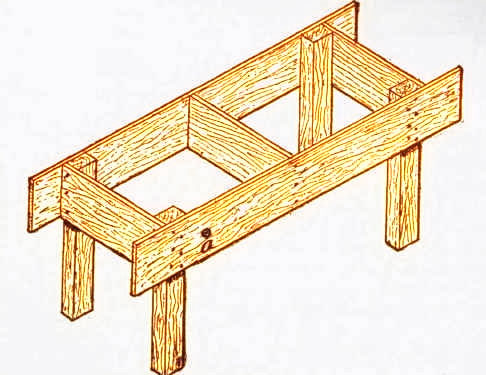 To do this, take the joist and lay it on two boxes or old chairs (Fig. 38), which you can use temporarily for sawhorses, until you make a pair. See whether either end is cut off squarely. If neither is, mark a line by the square a short distance (perhaps half an inch, according to the condition of the end of the joist) from one end, on one side of the joist. Carry this line around the joist by applying the square to each side successively, and saw off the waste end with the cross-cutting saw. Having one end square, measure from that end 2' 5" and mark a line around the joist as before. Saw this piece off, and using it as a measure (but not as a square), mark and saw off three more pieces. These are for the legs. The reason for making this bench 5' 10" long, instead of cutting a 12' board into two lengths of 6' each, is that it is hard to get boards sound and square at the ends, and so it is best to allow a few inches for waste. Of course your bench can be of any desired length. Six or eight feet is suitable for ordinary work, but there is no objection to making it as much longer as your space and material will admit. The height should bear a proper relation to the height of the workman. No definite height can be given. Try moving a plane back and forth. If your right elbow, when holding the plane, is slightly bent and your back about straight, the height will be not far from right. Do a little simple work at a table, trying different heights, and you can soon tell what will be satisfactory. If the bench is too low, you cannot manage your work well and your back will get tired from bending over, not to speak of becoming round-shouldered. If the bench is too high, it will be hard to manage your work, you cannot plane well, and your arms will be tired from holding them up unnaturally high. A bench for heavy work like carpentry is usually rather lower than one for cabinet- or pattern-making, while a carver's bench is usually higher. Next, from the short 10" board, mark and cut off two pieces 1' 10 1/4" long in the same manner (Fig. 39), seeing first that the end from which you begin to measure is square. You do not need to mark the under side of the boards, but only the top and the edges. Now square a line 1" from each end of each of these short boards, and start three nails on each of the lines by driving them nearly through the board (Fig. 40). Next, place the end of one of these boards on the narrow side of one of the legs, and, holding it firmly in position, nail it securely to the leg. You must take pains to keep the leg and the cross-piece "square." Nail only one nail first and then adjust, testing with the try-square before driving the other nails (Fig. 41). Then nail the other end to another leg, and repeat the process with the other board and the remaining legs. This will give two frames like Fig. 42. Next, fasten the sides to the legs. Take the 10" board and mark and saw off two pieces 5' 10" long in the same way as before (Fig. 43). At distances of 7" and 12" from each end of each board, mark lines across the side with the square and start nails between these lines (Fig. 44). Then, fitting these lines at the outside edges of the legs, nail the sides securely to the legs, as shown in Fig. 45. But drive only one nail through into each leg at first, until you are sure that the frame is coming together square and true throughout. Test the angles with the square. Stand the frame on as level a surface as you can find and sight across the top endways and crossways to see if either corner sticks up or down. If the top is not true, twist the frame enough to make it so, which you can easily do if you have but one nail in each corner. When the top is true and the legs at right angles, drive in the rest of the nails (Fig. 45). Be sure to test the top for winding, as just said, rather than to trust to the way the legs stand on the floor. Floors are often uneven, and the legs may not be cut exactly the same length. Make the top true and the legs can easily be made to fit the floor afterwards. The piece of 10" board left over you can fit to slip in between the sides, as in Fig. 45. If you nail through the sides and top into this piece, it will stiffen the bench. In making a long bench after this pattern, it is well to insert a few pieces of plank or joist between the sides in this manner.